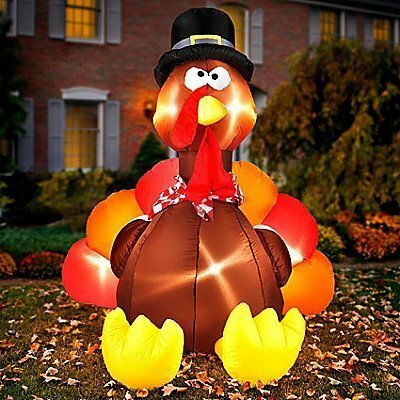 Thanksgiving LED Light Up Inflatable includes a 6 Foot Inflatable Turkey with a fixed Sand Bag, 2 Fasten Ropes, 4 Ground Stakes and a Plug with UL Certification. LED Swirling Lights Built Inside. Light up in the Evening for the Best Attraction to Neighbors and Guests. Very Easy to Use. Everything pops up in a minute! Superior Quality. Deluxe Set. Perfect for Thanksgiving Outdoor Yard Garden Decorations; Thanksgiving Event Decoration, Thanksgiving Night Event. CHILD SAFE: Non-Toxic. Meet US Toy Standard. Safety Test Approved. 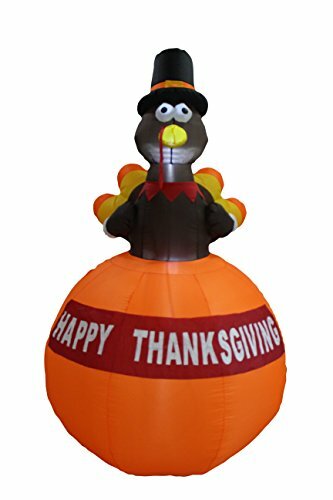 Thanksgiving LED Light Up Inflatable includes a 5 Foot Inflatable Turkey on Cornucopia with a fixed Sand Bag, 2 Fasten Ropes, 4 Ground Stakes and a Plug with UL Certification. LED Swirling Lights Built Inside. Light up in the Evening for the Best Attraction to Neighbors and Guests. Very Easy to Use. Everything pops up in a minute! Superior Quality. Deluxe Set. Perfect for Thanksgiving Outdoor Yard Garden Decorations; Thanksgiving Event Decoration, Thanksgiving Night Event. CHILD SAFE: Non-Toxic. Meet US Toy Standard. Safety Test Approved. 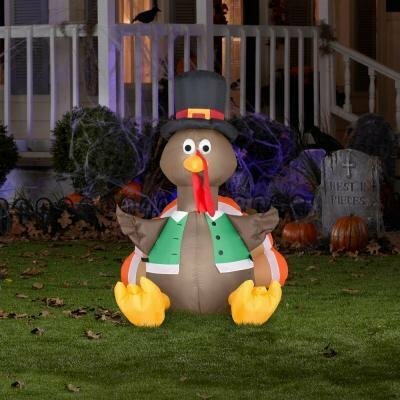 There will be no mistaking it is Thanksgiving with this 3.5 ft. Inflatable Lighted Turkey on your lawn. 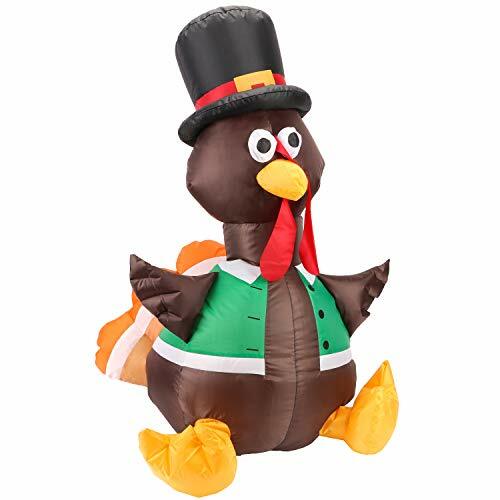 Perfect for greeting your guests, this happy guy is festively attired in a pilgrim hat, self-inflates in just seconds and lights up for nighttime enjoyment. Tethers and stakes are included to make sure he stays put and his weather resistant material ensures he will be around to entertain the neighborhood for Thanksgivings to come. 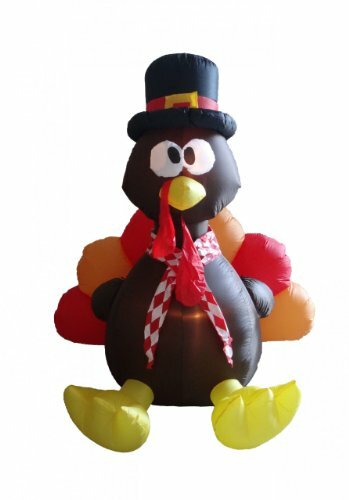 6' Tall Brown & Orange Air blown Inflatable Turkey Easy Set Up Includes Stakes & Tethers UL Approved For Outdoor Use. With self-inflating design, this Turkey will be presented in front of your family or love ones in seconds. With the lights, it is the perfect decoration at your front door or backyard at night. Worried about storage? Simply let the air out and fold it! Caution: Do not inflate during storms or strong winds. Protect fan and power cord from water. Operation not recommended in temperatures below 14 degrees F (or -10 degrees C). Share the joy of the wonderful festival with GOT INFLATABLES. Please check out our other GOT INFLATABLES Halloween and Christmas Decorations! 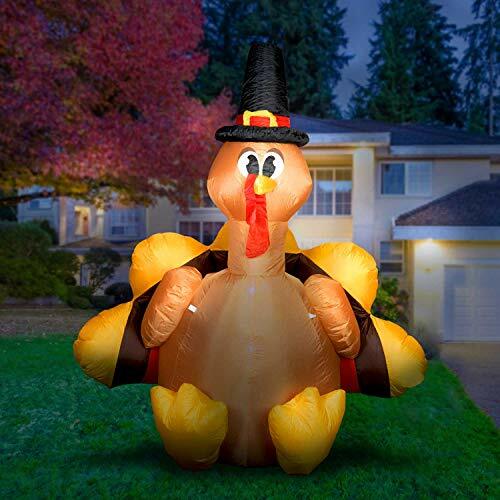 Show your Thanksgiving spirit this year with the Holidayana supersized 6ft Inflatable Turkey with Built-in Light! Why wait for the Macy's Thanksgiving parade to see ginormous airblown decors when you can have one sitting at your yard? Towering at 6ft when fully inflated, the Holidayana Turkey decked in a pilgrim hat is the perfect addition to your Thanksgiving and Autumn display. It even comes with a powerful fan for a quick and smooth setup. 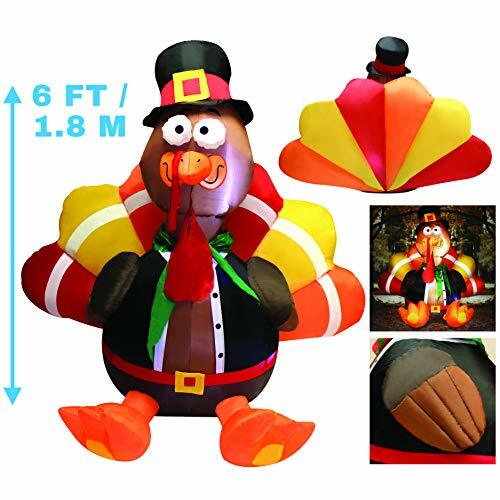 Thanks to its tie-down points feature, the 6ft Airblown Turkey gives you plenty of display options! Whether you use it in your front yard, in farmer's markets, or pumpkin patches, it will stay securely in place! This supersized Turkey will also see you through festivities that last all-night long. With built-in super bulbs, it creates a glowing nighttime display. 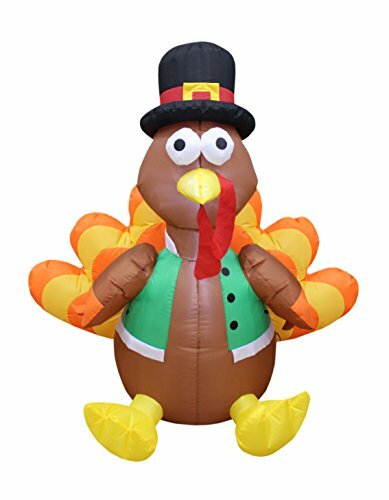 Easily deflates for quick storage and made with quality materials for longer use - the Holidayana 6ft Airblown Turkey is guaranteed to be one of your favorite Thanksgiving ornaments! 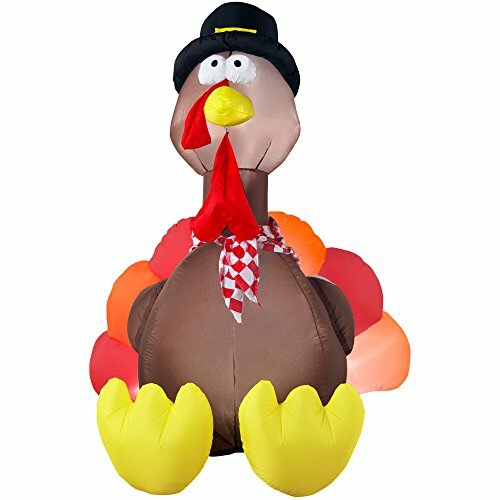 The Gemmy Airblown Inflatable Original Turkey is made of weather resistant material that makes it perfect for indoor and outdoor use. 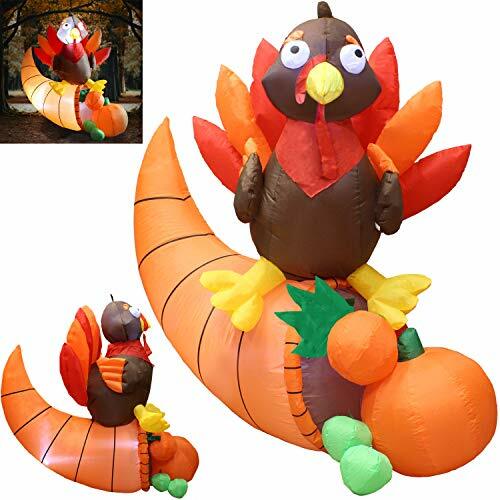 This thanksgiving inflatables is sure to bring delight to children and adults alike. It comes with everything needed for an easy setup. Just plug it in, stake it down and watch the magic unfold.